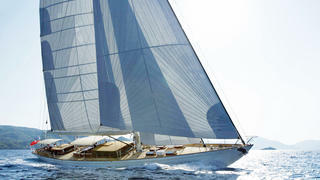 The 32.62 metre sailing yacht Jazz Jr has been sold with Hoek Brokerage acting for the buyer and seller. Built in mahogany on laminated oak frames by Turkish yard Turquoise Yachts to a design by Hoek Naval Architects, she was delivered in 2009 and went on to become a finalist in the 2010 World Superyacht Awards. RINA classed, she sleeps eight guests in a classic interior consisting of a full beam master suite with two skylights, plus a double and two twins, all with en suite shower facilities in marble and teak. In addition, there are quarters for four crew. The split level deckhouse has ample room for entertaining and relaxation, with the upper part offering a games table, comfortable seating, a bar, ice maker and fridge. The lower area houses the main dining table with seating for eight guests along with an entertainment centre featuring a large screen plasma television set. Opening skylights give this area a light and airy atmosphere. The centre cockpit is uncluttered, free of any sailing gear, and comes with upholstered bench seating, a table and occasional chairs for up to 10 guests, all sheltered by a large permanent canopy. Under power, a 450hp Caterpillar diesel engine gives her a cruising speed of 10 knots, while a 41.5 metre mast and no less than 676 square metres of sail give her an exhilarating performance out on the open sea. Lying in the Eastern Mediterranean, Jazz Jr was asking €3.8 million.